Is the time coming for Marines in Afghanistan to spread out and fight insurgents in more provinces? Maj. Gen. Richard Mills, commander of Marine forces in Afghanistan, made that case in interviews over the weekend, telling reporters that as the Corps continues to push insurgents out of population centers in Helmand province, they may need to expand where they are operating to places ranging from the Iranian border to neighboring Uruzgan province. He added that a small number of forces under his command Marines already are operating in neighboring Kandahar province, where Army forces have been locked into a struggle with the Taliban around Kandahar City, the second largest city in Afghanistan. Mills doesn’t say much specifically about the 26th Marine Expeditionary Unit, but notes that Marines “are still actively engaged in an area called Gereshk.” He has said previously that 3rd Battalion, 8th Marines, the MEU’s ground combat element, would deploy to the upper Gereshk Valley. If so, it certainly sounds like the MEU is keeping busy. Mills says that he has “forces in a little piece of Kandahar province in order to relieve some of the Army forces there so they can concentrate on Kandahar.” He didn’t offer any additional details initially, but that’s certainly news to a lot of folks following along at home. UPDATE: A Marine spokesman later clarified that the RC-South troops in Kandahar are British in, and deployed in Maiwand district, which borders Helmand. A commenter below suggests they’re from 2 Royal Welsh, which would make sense. Mills says Nimroz province, to Helmand’s west, is a “province of import,” even though Marines haven’t operated there much recently. In particular, a border crossing between Nimroz and Iran needs policing, he says. Things could get interesting this summer if details Mills laid out this weekend are any indication. In addition to working in Helmand and Nimroz provinces, Marines could be sent to other, neighboring provinces as they expand their reach and “security bubble,” he says. “We’re bound to look to the west into Farah province, we’re bound to look to the east a little bit into Kandahar to link up to with the Army over there, and also to the northeast where, again, beyond the Kajaki Dam up into Bagram and Uruzgan to begin to expand that security bubble around some key economic corridors that exist,” Mills said. A substantial amount of conventional Marine forces operated in Farah before RC-Southwest existed. The province now belongs under RC-West, under Italian control. Uruzgan is a rugged, mountainous province to Helmand’s northeast. Australian troops have patrolled the area, but there’s some question over whether that will remain the case. We need to bring the Marines and the Soldiers and the Airmen home. Al Qaeda is defeated. The Afghans can build their own nation. Let’s root them out where they are, not where they ain’t. Hey there norman, I realize that you may be a big supporter of the military, but something that you are failing to realize is that it is unethical and immoral to just go cruising into someone elses house break their stuff then just walk out, that why we have a few units rebuilding some of the areas of their nation, not because we really want to but because its the right thing to do. You can’t just go starting a war with every country and walk away because sooner or later you will have the whole world upset with you, so in the end we are establishing friends with their government. I think the RC (Southwest) forces operating in Kandahar that Mills is referring to are not Marines, but UK troops…a company from 2 Royal Welsh, which falls under Mills’s command, has been operating in Kandahar’s Maywand district since December. There are elements of the 26th MEU operating in Kandahar. I caught that report this morning, too. Marine spokesmen in Afghanistan said last week that the RC-South forces in Kandahar were British. We’re reaching out for additional details. Another update, folks: Marine officials in Afghanistan say that the casualty referenced above did not get shot in Kandahar province, as reported by the AP. 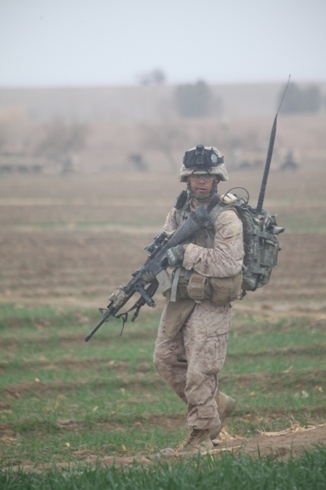 He died in Helmand, likely in the Upper Gereshk Valley, where the 26th MEU and BLT 3/8 have been operating. After nine years, Chesty, I think we’ve made our point. Sheesh. What a tool.